Greek Key Flat weave Rugs / Mats. Offer an attractive, practical floor covering that is anti-slip, stain / water resistant and easy to clean. 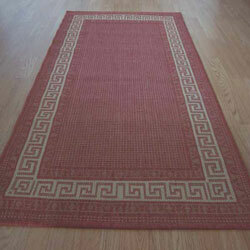 Greek Key rugs are ideal for Kitchens, Conservatories, Entrances and Hallways. This range is machine made in Egypt, the pile is 100% polypropylene and the backing is anti-slip latex gel. Available in 5 sizes which include a runner and 5 colour options.